Ever wonder what goes on behind the scenes during a video shoot? Watch the all-new Maverick X ds Turbo go head-to-head with the competition in this action packed exclusive video. 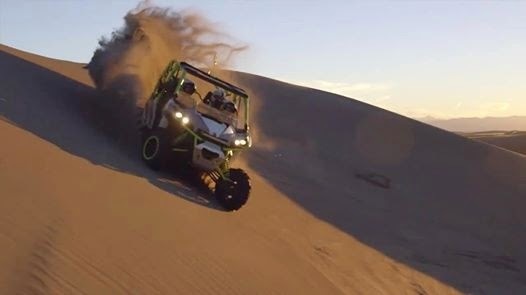 The Can-Am Maverick X ds side-by-side vehicle boasts industry-leading power with the new 121-hp Rotax 1000R turbocharged option, providing 10% more horsepower and almost 40% more torque than the closest competitor. It also features a completely new rear end providing a longer, 88-in (223.5-cm) wheelbase, a redesigned TTA rear suspension now featuring 16 in (40.6 cm) of travel and Can-Am exclusive high performance Fox shocks to provide capability, comfort and adjustability. This model soaks up terrain and remains nimble. It is tailored to fit riders and their riding style with its premium rider-focused cockpit and ergonomically positioned controls and adjustments. Pure sport side-by-sides demand high-performance shocks. That’s why the Maverick is equipped with Exclusive FOX 2.5 PODIUM RC2 shocks. Front and rear shocks feature adjustments for Dual Speed Compression (DSC), rebound and dual rate spring with infinite preload allowing to fine tune the system for any driving style, terrain or course conditions. The large-diameter bore allows for greater damping force capability, while allowing the shock to run at lower overall temperatures, offer less fade and more consistent damping. The rear shocks feature a position-sensitive Bottom-Out Control and a spring crossover that will allow for less compression damping at ride-height to improve comfort and traction while giving huge damping at the end of the stroke to flatten out the biggest of bumps. The 7/8-inch shaft gives the rear shocks a lot of additional strength & buckling resistance to handle the most demanding conditions.